Today, I've got a super fun fine motor activity that not only will be a hit with the kids, it will work on a few very important skills. 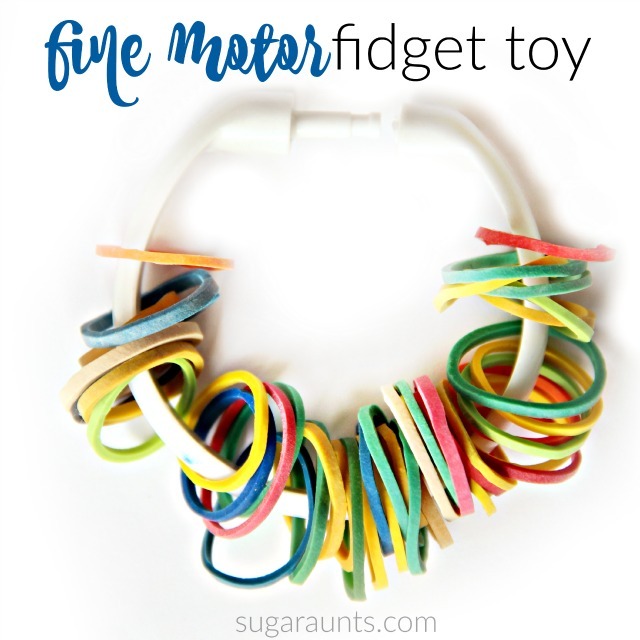 This fine motor fidget toy is fun for kids to make and works on visual scanning at the same time. 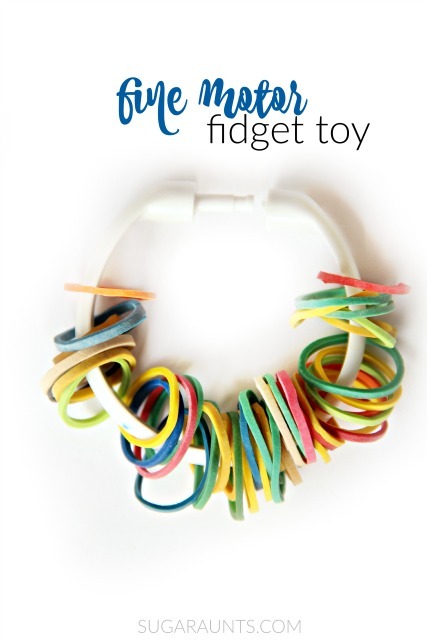 Then, when they are done, you've got a creative fidget toy that kids can use over and over again. Let's get started! But first, What is Visual Scanning? Scanning a worksheet for keywords, looking through a book for a certain page number, answering a multiple choice test question and scanning the list of options for the correct answer...This is visual scanning. Looking through a pile of shoes for the matching red one, searching for a friend's face in a crowded lunch room, doing a word search and looking for letters to make up a word...This is visual scanning. Visual Scanning is the voluntary fixation of the vision from one point in the visual field to another. Visual scanning is also be called saccadic eye movements. Scanning, or visual saccades, may be voluntary (such as in reading, or involuntary (such as during fast phases of vestibular nystagmus). We're going to discuss voluntary saccades in this post. 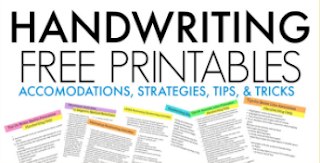 Gazing between two items (such as in answering multiple choice questions, or copying information from a blackboard) requires visual fixation and voluntary visual saccades. When a student searches a word search for a specific letter, they need to visually scan in a systematic pattern. That is, they need to look up, down, left, and right as they search for letter combinations. 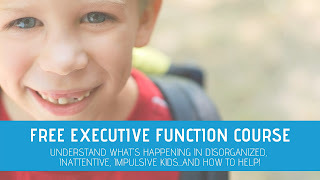 For a child who is doing an Easter egg hunt and searching a backyard for brightly colored eggs, they must look on different planes (high, low, near, and far) to find the eggs while avoiding obstacles. 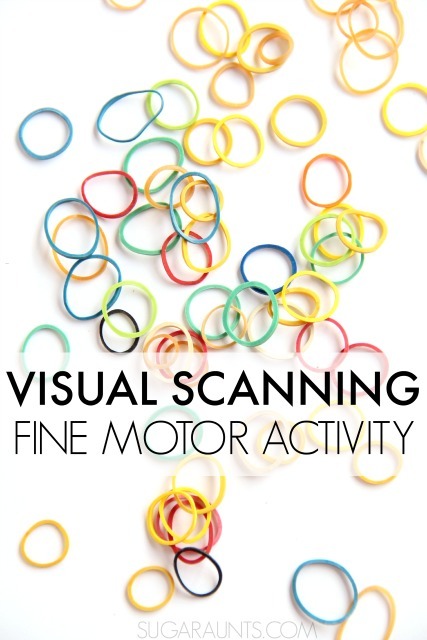 I've shared a few visual tracking activities lately in this Occupational Therapy series that I've been doing this month. You can check those out here and here for more visual processing information, but it's important to realize that visual scanning is different than visual tracking. 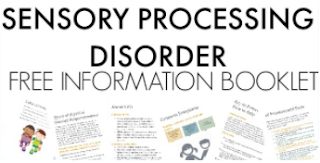 To visually scan, a child needs to view an object (red shoe, letters, or Easter egg) or area (page, corner of a book for book numbers, or lunch room) in order to locate an item or information. In visual tracking, one maintains visual contact on an object as it moves. 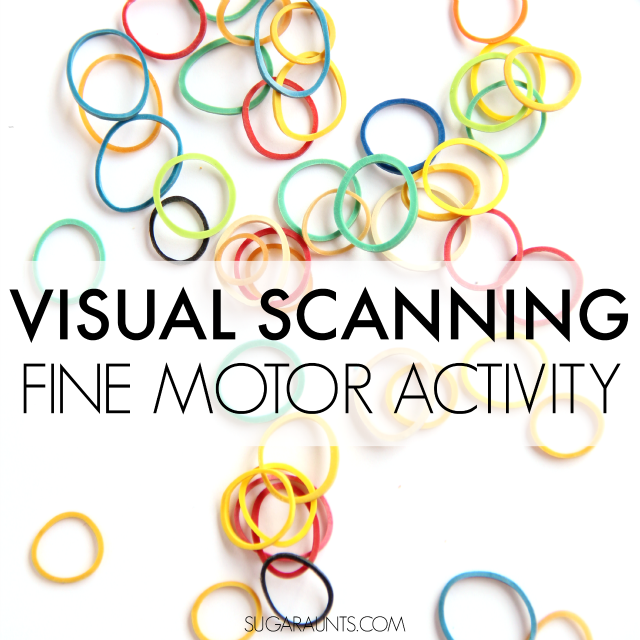 To do this easy Visual Scanning activity, simply scatter the rubber bands out on a surface. 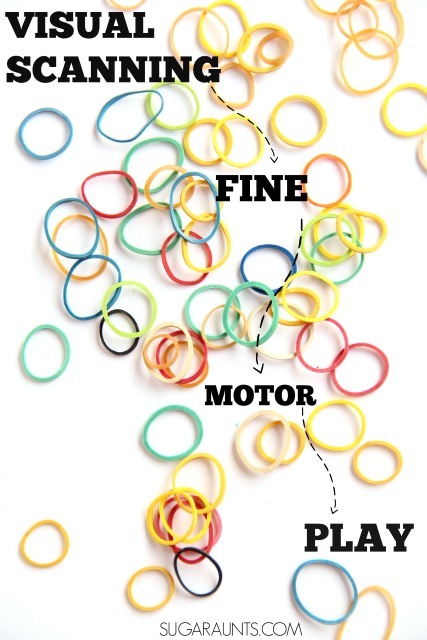 Ask your child to scan the rubber bands to find specific colored bands. You can call out colors individually or in patterns as they search for and find the correct colored rubber band. Make this activity easier (graded down) by removing the number of rubber bands or the amount of colors on the table. Make it more difficult (graded up) by adding more rubber bands and more colors. 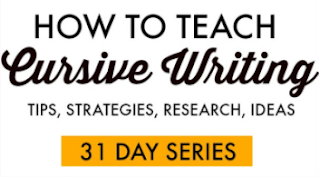 You can also add a larger surface area to make this activity more of a challenge. 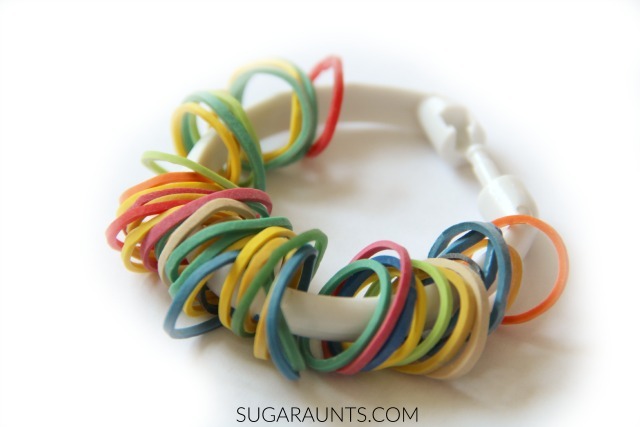 Simply spread rubber bands over a larger area with fewer of the specific colors you will be naming. Children then have to visual scan a larger area. You can further grade up this activity by adding obstacles to the surface. As the child scans for and finds the correct rubber band, have them thread it onto the shower curtain ring. 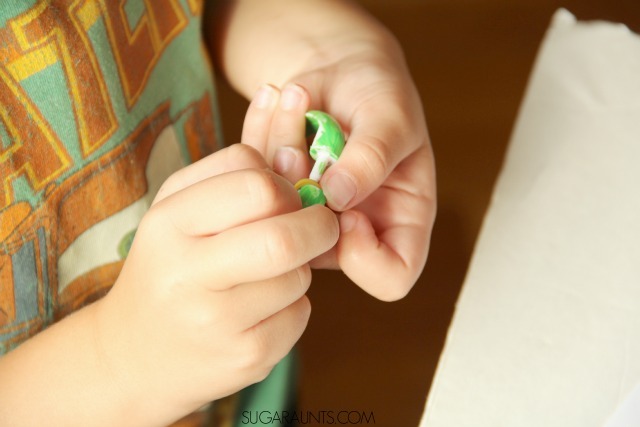 What a great fine motor activity for kids! They are working on their bilateral hand coordination as they pull the shower curtain ring apart and place the rubber band onto the ring. My daughter did this activity one afternoon when my nephew was over for the day. It was a quiet time activity that kept two four year olds busy for a long time. They both wanted to keep adding more rubber bands until their ring was filled. When the ring is filled with bands, you've got a fidget toy that can be used during homework or school work tasks. See more about fidget toys here. 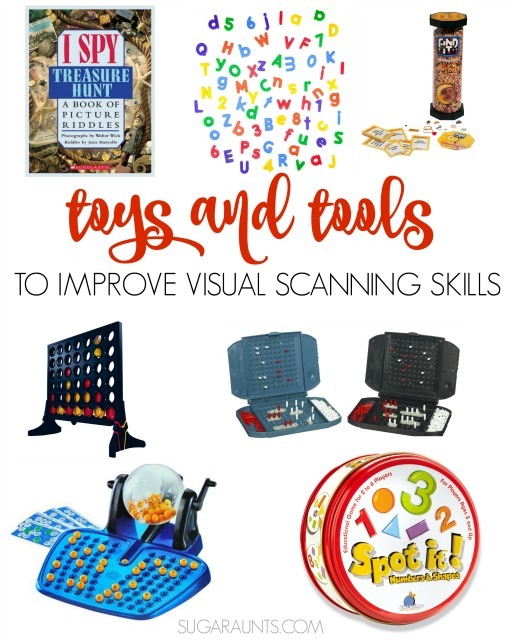 Have fun working on visual scanning skills and creating this fun toy! Looking for more ways to work on Visual Scanning? These are some fun ideas and toys that you can do to work on visual saccades in a creative and playful way. Word Searches. Have children scan for letters and highlight all of the letter "A's" in one color. They can then go through and search for more letters using different colors. Play Bingo to work on scanning for numbers going up and down a card. Use Letters and Numbers to search and find letters in an activity like the one we did here. Find It Discovery Bottles OR, make your own, like our Alphabet discovery bottle. Games like Battleship and Connect Four work on visual scanning skills. Spot It! is another fun game for kids. More visual perception activities that you will love can be found on our Vision Page and over on our All Things Vision Pinterest board.